For those working towards an all-encompassing bike culture, beware. Bike theft is one of the flipsides of a city overflowing with bikes. The statistics in Denmark are such: In 2006 there were 182 bike theft reports filed each day. That adds up to 66,277 that year, on a national level. In Copenhagen alone there were more than 16,000 bikes stolen. It is not hardended criminals or junkies stealing that many bikes. All too often it is a regular Joe heading home from the bars in the early morning and finding an unlocked bike. Many of my friends will reluctantly admit that they have nicked a bike - or tried to - at some time in their past. Reporting stolen bikes in Copenhagen is easy. The police have a website and you fill in the form in a matter of minutes. You call your insurance company and they can see the form on their computer. A cheque is in the post. 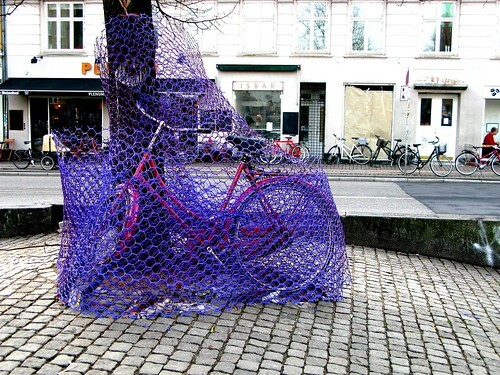 However, Copenhagen City aims to end the tyranny of bike theft. Bikes in the near future will be equipped with an Rfid [radio frequence identification] chip under the saddle. It will then be more difficult to use a stolen bike after you nick it. The idea is that the good people who wander about giving out parking tickets will be equipped with a scanner that will reveal if parked bikes are, in fact, stolen. The police have agreed to share their database with the parking attendents in order to join forces. The City of Copenhagen has put 1.5 million kroner [€200,000 / $300,000] into a pilot project on all of the city's City Bikes this summer. If it is a success, they will figure out the practical details, including how to finance it, and how to cooperate with bike shops. Critics say that it won't stop bikes being stolen in the first place. However, something needs to be done and any action towards a possible solution is a good thing. Regarding bike locks, we have a post about how Danes lock their bikes here. tags: "bike culture", "bike lock", "bike politics", "bike theft"